Jamesie is the bass drummer with the band and is also responsible for some of the bands vocal works. Born in Glasgow in 1973, he was raised there and left school at an early age to become an apprentice motor mechanic. After serving his time as a mechanic, he moved on to other forms of employment one of which was doing some film work for various UK film production companies and the discovery channel. 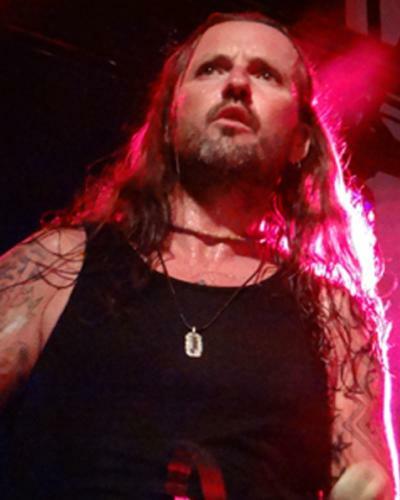 Jamesie’s musical influences are mostly rock and roll, with bands like AC/DC, Mötley Crüe, Metallica and Pink Floyd being some of his favourites. He is also very fond of classical music and enjoys the works of Bach and Yanni. If i was the town Mayor, I would…: Declare a town wide day off once a month – Steve McQueen Day – where people dress like Steve, drive like Steve and sit about watching his movies…Viva La McQueen! Donnie is our world-renowned bag piper, we (lovingly) call him bullfrog, if you ever see him play you’ll understand why. 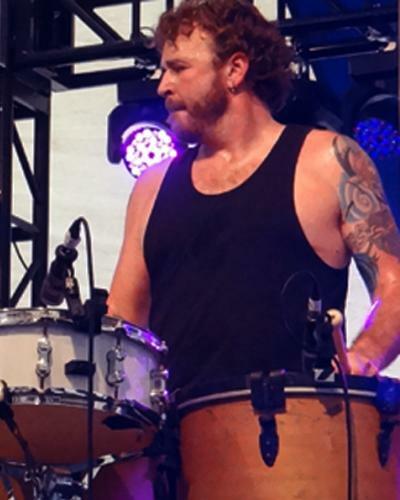 He is extremely talented on other instruments too – a wicked drummer, and also plays piano and guitar. 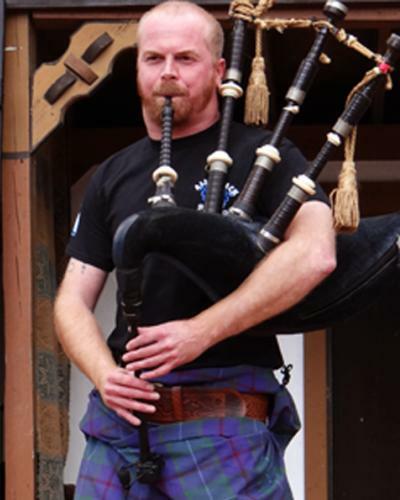 Having played the pipes in many competitions and town halls throughout Scotland, he felt it was time to leave the traditional piping to the traditionalists and branch off into something more unique! When Donnie’s not touring, you will find him up the Islands on the northwest coast where he likes to do some composing, and also pursue liquid entertainment, but not necessarily in that order. Donnie can also be found relaxing at home watching the football, and of course being a dad. In my spare time I like to… : Watch the footie ! If i was the town Mayor, I would…:Make having a Friday night ceilidh compulsory! 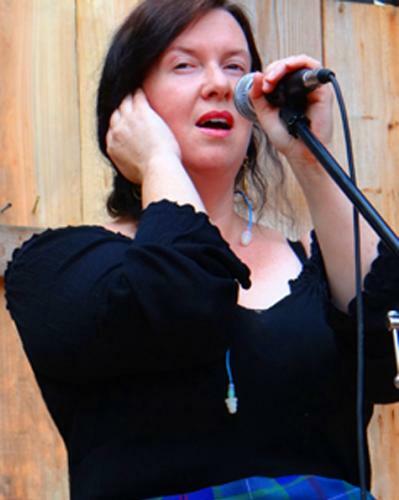 Jacquie is the bass rhythm drummer in the band and is known for her haunting vocal skills. Born in Paisley and brought up just outside Glasgow, from an early age she enjoyed horse riding and archery and later developed a passion for motorcycles and all things Scottish. Initially trained in stage management and film technology, she eventually joined a Scottish Re-enactment organisation through which she met most of her current band mates. Over the years, she was involved in many different film, television and theatre productions, music was a natural progression from this and after playing for over 5 years under a different name she and the boys decided to take it further ! She is a true “home girl” and when she’s not touring, loves nothing more than spending time with her family and friends. Favourite Drink: A good cup of tea! If i was the town Mayor, I would…: Improve jobs, education, emergency services and build an awesome Ceilidh club! Colin has been a musician since he was just 8 years old, when he started out playing the snare drum in the Neilston & District Pipe Band, where he took part in various gigs and competitions throughout Scotland and Europe. His talents are not limited to the snare drum however, in addition Colin plays many other instruments including; drum kit, percussion, Bodhran, bass guitar, electric and acoustic guitars, to name but a few – he has played various instruments in a few different bands over the years – but his passion lies with the drums ! For the last 5 years Colin has been playing drum kit with ‘das contras’ a Latin funk band, ‘the Gus Munro band’ a blues band, and other traditional Scottish folk bands, along with artists such as Paul McKenna and Finlay MacDonald. 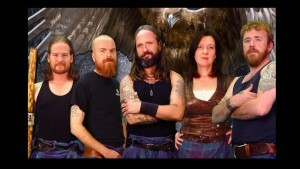 Of course, Colin has now taken up the position as Albannach’s new lead drummer ! When he is not playing music, Colin goes swimming and enjoys a spot of fishing now and again, he also has a passion for motorbikes. Favourite Drink: A good IPA, the kind that puts hair on your arse and fur on your tongue. Aye! In my spare time I like to… : Go out on the bike, fishing, and watching live music. Raised in Philadelphia, DidgeriDrew, or as we like to call him “Token”, is the only American born Scotsman of the band. Despite his geographic location, as a child, he was surrounded by Scottish music and Scottish heritage. 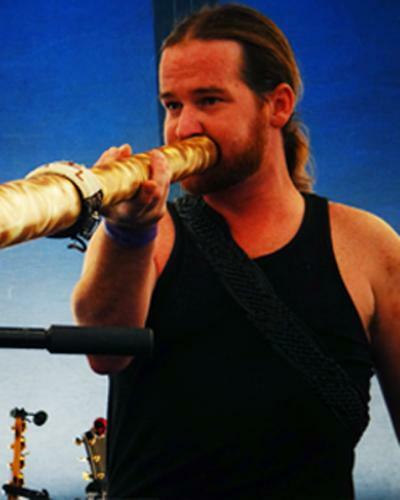 As a young man backpacking in Colorado, he bought his first didgeridoo. While walking back to his hostel, he heard the familiar sound of bag pipes and followed them – like any good Scotsman would. He had no idea that moment would be the beginning to an adventure that would lead him to Los Angeles, and then eventually to tour the world, with the band Brother. Taking his rhythm on the road with us, as a guest performer, DidgeriDrew’s tribal sound worked out so well we decided to make him our first “Token” American band mate. When DidgeriDrew is not playing music he can be found building his custom made didges, farming and at home relaxing with his kittens. If i was the town Mayor, I would…: make everyone do the Lambada! You can listen to some of our music using the players below. To download sample tracks for media use, please use the buttons at the bottom of this page. The following audio samples can be downloaded and used in promotional works. Please contact us if you require footage for promotional purposes. Below you will find a variety of images which we have approved for media/PR use. Some images are for web use and some for print use. If you require other/custom artwork, please contact us using our media enquiry form. Note, some images have a transparent background, white images in particular may not show up correctly in your browser. Click on the folders to view the available approved images, click on an image thumbnail to open a fullsize version which you can save for use in editing software, etc. 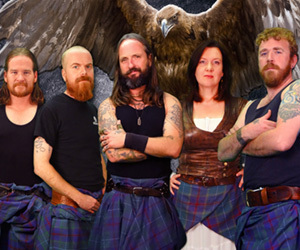 Web Banner 1920x400px Band, Eagle, Logo. Below is a layout of the stage plot that we generally require. 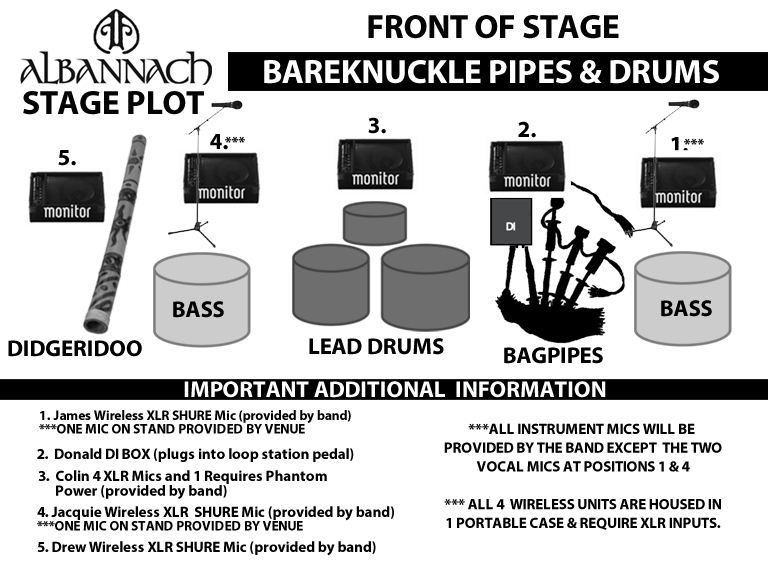 Click the image below for a larger view, or click here to download a PDF/printable copy of the stage plot. 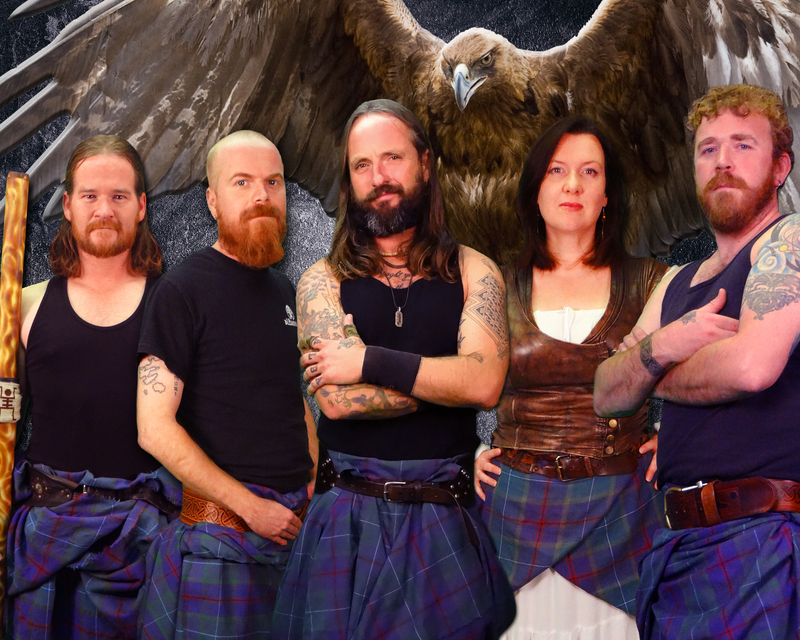 As a presenter of Celtic Music we hear everything from Traditional to Celtic Rock. Whether it be Irish, Scottish, Canadian, Australian, South American or USA in interpretation, we have had it all. Some acts grow on you, some never will. But with Albannach it is different. Gut grabbing from the go. No time for thought. No time but to get caught up in the beat, the intensity, the passion. Where are the fiddles and guitars ? Penny whistles and the mandolins ? Who cares ? This isn’t your grandfather’s Celtic beat ! The crowds swell and sway, leaps into the air, shouts approval, many transfixed and are taken centuries back and are a part of some long ago battle, in some far away Scottish Glen. As the drums are beat, the pipes are screaming, the feet crash on the stage, all of Albannach is moving faster and faster, arms flying, sweat pouring and the blood in the audience’ veins races. 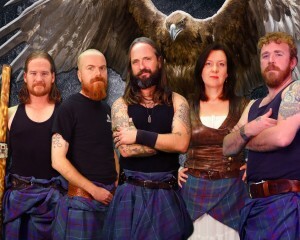 The Highland Council booked Albannach to close their 2008 Hogmanay Party in front of a crowd of 11,000 in a specially constructed outdoor arena in Inverness. We were looking to bring our show to a rousing conclusion and we knew that following the excitement of the countdown to the bells, our fireworks display and a mass Auld Lang Syne that we needed to book a band that would have our crowd dancing on what we correctly assumed would be a freezing cold night. Within seconds of their set starting it was obvious that we had made the right choice in asking Albannach to close the show and I would recommend booking them without hesitation. If you are interested in booking Albannach or having us appear at your event or festival, please fill in our Booking Enquiry Form. This will be passed onto our booking agent who will check the details of your request and get in touch with you to discuss further. For official media enquiries, such as such as for interview requests, TV / radio / news appearances, and for image / digital media requests, please fill in our Media Enquiry Form. Your request will be forwarded to our media team who will be in touch with you as soon as possible.